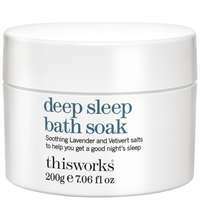 thisworks deep sleep bath soak 200g, a relaxing and de-stressing bath soak to help you unwind and aid a restful night. A tranquil blend of Lavender, Vetiver, Chamomile and Patchouli; thisworks award-winning signature deep sleep tragrance, are combined with Maris Sal Sea Salt to create therapeutic bath salts. Soak away anxiety and prepare mind and body for sleep. Active Ingredients: Sea Salt, Lavender Oil, Patchouli Oil, Ho Wood Oil, Vetiver Oil, Wild Chamomile Extract. thisworks deep sleep bath soak 200g was found on 4 websites and was price compared using EAN: 0876972000962. The cheapest thisworks deep sleep bath soak 200g is shown as the main item, prices range from £18.70 to £22.00, excluding delivery. Price comparison based on price and delivery charges, with any valid discount codes being applied, is shown in the table above. Prices and information correct at the time of publication.